After publishing the fifth Whiskey Mattimoe mystery last year, I decided to tune up my writing instrument by crafting a play. Writing for the stage taught me most of what I know about characterization, plotting, and dialogue; thus, I was curious to see how my experience as a novelist might enhance my work as a playwright. It's no secret that I love to ride a bike. That's one of the passions I share with the fictional Ms. Mattimoe. I embrace bicycling as a sport, a pastime, and a mode of transportation, as well as a viable form of physical and emotional therapy. A wise friend once said, "It's impossible to be depressed on a bike." My latest play takes place on bicycles. Literally. 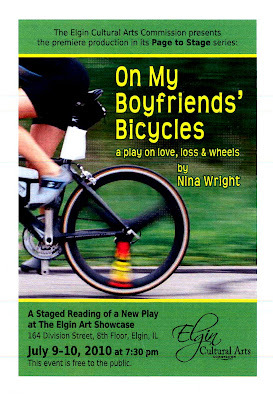 On My Boyfriends' Bicycles--subtitled "a play on love, loss, and wheels"--was conceived for performance as either a stage play, in which actors creatively suggest that their characters are riding bicycles, or a site-specific play produced outdoors with actors using actual bicycles. The script will have not one but two staged readings in Chicagoland this summer. I am blessed to be reunited on this project with director Richard Pahl, whose keen eye for casting and staging makes him one of the most popular auteurs along the Fox River. While in Elgin for the staged readings this summer, I'll also teach a writing workshop. So if you're in or near that part of the world, come on over! In the meantime, do what Whiskey would do on a fresh spring day: get out there and ride your bike. Abra and I are in Wikipedia!